Almonds make a nutritious and delicious snack, offering a bounty of protein, fiber and healthy fats. 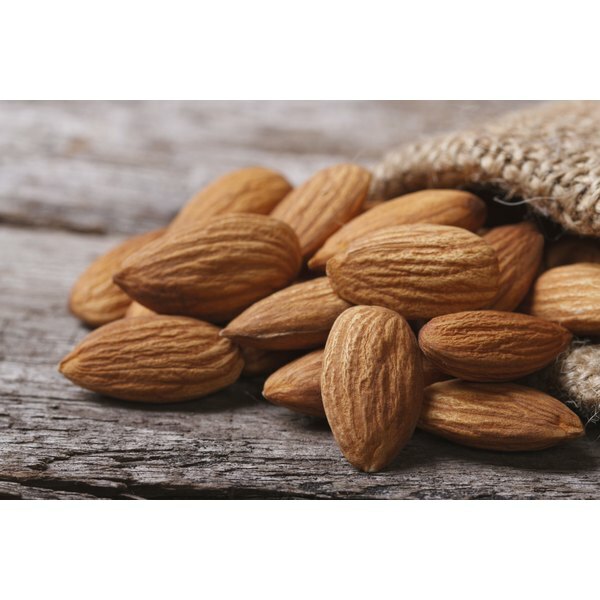 Following two outbreaks of salmonella poisoning in 2001 and 2004 traced to raw almonds, the U.S. Department of Agriculture began requiring all almonds sold in stores to be pasteurized, or treated with heat, including blanching, roasting or steaming. Although contamination is rare, eating contaminated raw almonds could make you very sick. Some varieties of "raw" almonds are not actually raw. These almonds have been heated to a high enough temperature to kill bacteria, but not so high that they are cooked. You can find truly raw almonds that have not been treated at all online. Nuts are not commonly contaminated with harmful bacteria, but all dried foods run the risk. Salmonella infection usually causes no symptoms, but some people may develop fever, diarrhea and abdominal cramps up to three days after consuming the bacteria. Most people recover without medical treatment, but people with compromised health may be more severely affected. Death is rare, but possible.